A lot of bands during the 1950s and 1960s were called the Mark Four. Some achieved moderate success with their records, other remained obscure acts. 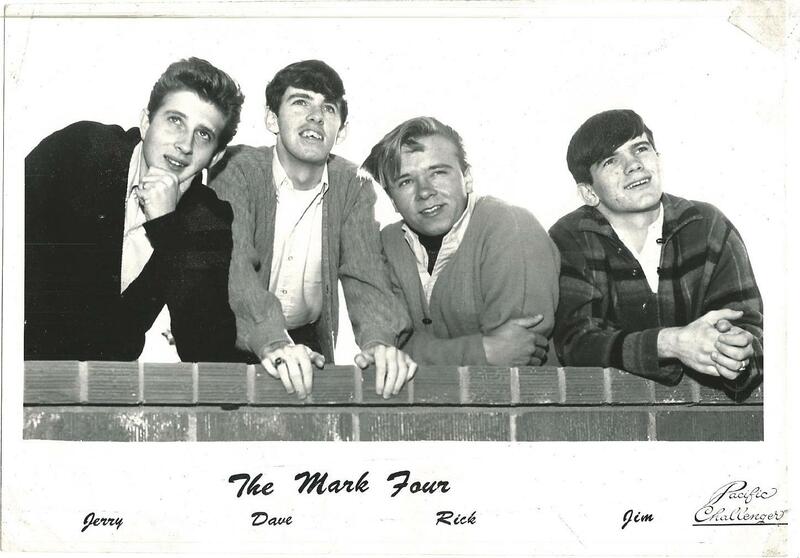 Today's Mark Four were a group from California whose two singles for Pacific Challenger became two minor classics in Surf/Garage music. Four young boys founded the Mark Four in the fall of 1963. The line-up consisted of Rick Whittington on lead guitar, Jerry Ainsworth on rhythm guitar, and David O'Brien on drums. Jim Patton on vocals and sax joined the group soon after. Their manager became Whittington's father, who possibly got them a recording contract later on. Since all of boys were 16 or 17 years old, the band didn't play any clubs but appeared at a lot of sock hops and dances all over southern California. They regularly played the Retail Clerks Union Hall, the Rolldrome, and of course many high schools. Already in 1963, the band got aquainted with producer Bob Mahoney, who signed the boys to his Pacific Challenger record label. The band held two sessions for Mahoney, the first one took place in 1964 at Western Recorders in Los Angeles and produced the single "Just My Dream" b/w "Swingin' Hangout" (Pacific Challenger 1002), two Jim Patton originals. Patton remembers the record sold about 5000 copies but never saw any money from it. A second disc was recorded later that year at Mahoney's Pacific Challenger studio in Hacienda Heights, California. The result was "Go Away Now Little Girl" coupled with "Forget It Baby" released on Pacific Challenger 1004. Mahoney had some business connection with Murray Wilson, manager of the Beach Boys (and father of three of them: Dennis, Carl, and Brian). Through Murray's help, the Mark Four opened a Beach Boys concert on February 7, 1964, at the Pavilon Ballroom in Huntington Beach. The Mark Four lasted for abour one and a half years, disbanding around the end of 1964. Jim Patton went to college and remained friends with Dave O'Brien but lost track of Ainsworth and Whittington. Patton and O'Brien still make some music together and recently produced a demo CD with a selection of their songs. My dad is Jerry ainsworth and growing up he always played music, but I had no idea of this band. I have called him and I'm very proud of him. How can I get a copy of a Mark Four album or some songs? Jerry Ainsworth is my uncle. Social media...wow! Hi, there are some original 45 rpm records on ebay.com. Go and type "Mark Four records" into the search field. Both records are minor classics now so they are worth 30 up to 100 $. This has been so cool...thanks Alexander! Since you did this story and thanks to Colleen Mahoney (Producer Bob Mahoney's daughter) all of us in the Mark Four have gotten in touch with one another....after almost 50 years! Unbelievable! Sadly David O'Brien, drummer passed away Jan 13, 2019. Good friend, kind and thoughtful with a quick wit. Drummer and songwriter. Was also was a Drummer with Animotion and Red Zone. David will be greatly missed. RIP my dear friend.